Sclafani, Christie J. 2006. Astragalus brauntonii. In: Fire Effects Information System, [Online]. U.S. Department of Agriculture, Forest Service, Rocky Mountain Research Station, Fire Sciences Laboratory (Producer). Available: https://www.fs.fed.us/database/feis/plants/forb/astbra/all.html . The scientific name of Braunton's milkvetch is Astragalus brauntonii Parish. (Fabaceae) [16,19,24]. Braunton's milkvetch is endemic to southern California, ranging from the central south coast of California to the north Peninsular Ranges of the Los Angeles Basin in Ventura, Los Angeles, and Orange counties. According to California Natural Diversity Database reports, there are 28 known locations of Braunton's milkvetch in Los Angeles and Orange counties. Braunton's milkvetch is limited to 4 general areas in the Santa Monica, San Gabriel and Santa Ana mountains and Simi Hills in the San Fernando Valley [7,8,16,34,36]. The Jepson Flora Project provides a distributional map of Braunton's milkvetch. Braunton's milkvetch is limited to carbonate soils (limestone outcrops) in chaparral, coastal sage scrub, closed-cone forest, and grassland communities of the southern California mountains [7,16,33,36]. Chaparral shrub species associated with Braunton's milkvetch include chamise (Adenostoma fasciculatum), red shank (A. sparsifolium), manzanita (Arctostaphylos spp. ), ceanothus (Ceanothus spp. ), laurel sumac (Malosma laurina), and sumac (Rhus spp.). California sagebrush (Artemisia californica), California buckwheat (Eriogonum fasciculatum), and woolly sunflower (Eriophyllum lanatum var. obovatum) dominate southern coastal sage scrub communities where Braunton's milkvetch occurs. Black sage (Salvia mellifera), purple sage (S. apiana), chaparral yucca (Yucca whipplei), and golden-yarrow (Eriophyllum confertiflorum var. confertiflorum) are common shrub species associates [9,25]. Braunton's milkvetch inhabits closed-cone forests of knobcone pine (Pinus attenuata) and Tecate cypress (Cupressus forbesii). Chamise, ceanothus, and manzanita are common chaparral shrub species associated with close-coned pine-cypress forests. Many species of oaks (Quercus chrysolepis, Q. vaccinifolia, Q. wislizenii) and pines (P. coulteri, P. radiata) are associates in knobcone pine forest with Braunton's milkvetch. California buckwheat, Parry's beargrass (Nolina parryi), scrub oak (Quercus berberidifolia), and heart-leaved pitcher plant (Lepechinia cardiophylla) are common species associated with Braunton's milkvetch in Tecate cypress forests [17,18,27,39]. Nonnative grasses such as oat (Avena spp. ), brome (Bromus spp.) barley (Hordeum spp. ), and rattail sixweeks grass (Vulpia myuros) dominate the annual grasslands of California where Braunton's milkvetch is located . Common native grass associates are purple needlegrass (Nassella pulchra) and other needlegrass (Stipeae) species . This description provides characteristics that may be relevant to fire ecology, and is not meant for identification. Keys for identification are available [2,16,24]. Braunton's milkvetch is a short-lived (2-3 years) perennial forb that grows to 5 feet (1.5 m) tall. Due to Braunton's milkvetch's considerable size, woody caudex, and multiple stout erect stems, it can be mistaken for a shrub [29,36]. The inflorescence is a raceme with 36 to 60 flowers. Unlike other species in the genus, the flowers turn brown and papery and are not immediately shed after fading. The leaves are pinnately compound, with 25 to 33 leaflets [2,16,24]. The seeds of Braunton's milkvetch have a thick, hardened seed coat. Braunton's milkvetch can be distinguished from other perennial species of milkvetch by the woolly haired stems and 2-chambered seed pods [16,34]. Braunton's milkvetch has a thick taproot . Braunton's milkvetch reproduces sexually [16,24], and may also sprout from the caudex . Breeding system: Braunton's milkvetch is monoecious, with bisexual flowers [16,24]. Pollination: Native megachilid bees and bumble bees pollinate Braunton's milkvetch [12,36]. Ants may also play a role in pollination . Seed dispersal: Braunton's milkvetch seeds do not have an apparent dispersal mechanism. Seeds most likely rely on water and gravity for dispersal . Seed banking: Braunton's milkvetch's thick seed coat allows seeds to remain dormant in the soil seed bank for many years . Germination: The seed coat of Braunton's milkvetch requires heat or mechanical scarification for germination. Scarification associated with disturbance increases germination success. Types of disturbance affecting the seed coat include expansion effects from wetting and drying, microbial degradation, heat from fire, and physical abrasion by soil movement . In a germination experiment, Fotheringham and Keeley  scarified Braunton's milkvetch seeds by exposure to heat or seed coat penetration, and obtained germination rates of 80 % or greater. Other germination studies on Braunton's milkvetch resulted in 60 % germination of heat-treated seeds and only 1% germination without heat (Carroll, M. 1987 as cited in ). Seedling establishment/growth: Because Braunton's milkvetch is a postdisturbance pioneer species, an open, light-intensive environment is most likely needed for seedling establishment and growth. In laboratory experiments, establishment of Braunton's milkvetch seedlings was greater in full sun and on limestone soils than in other environmental conditions and soil types . Braunton's milkvetch seedlings are low growing when 1st established, then develop into larger, more erect plants within the 1st year . Asexual regeneration: Information on asexual regeneration for Braunton's milkvetch is undocumented. Braunton's milkvetch has a woody caudex that may allow for asexual regeneration . Braunton's milkvetch is endemic to carbonate soils of the foothills of the southern California mountains. It commonly occurs in disturbed chaparral, coastal sage scrub, and closed-cone forests at elevations of 50 to 2,000 feet (15-610 m). Soil requirements of Braunton's milkvetch contribute to its limited distribution [7,16,24,29,33,36]. Braunton's milkvetch is an early seral species, appearing immediately following fire or disturbance. It lives for 2 to 3 years before senescing or being crowded out by later-succession vegetation . Braunton's milkvetch blooms from March to July . Fire adaptations: Braunton's milkvetch is a fire-adapted species. The thick seed coat requires scarification by fire or mechanical disturbance to germinate [29,36]. Although undocumented (as of 2006), Braunton's milkvetch may sprout from the caudex after top-kill. Further research is needed on Braunton's milkvetch's adaptations to fire. Fire regimes: Braunton's milkvetch occurs in a mediterranean climate, with mild winters and hot, dry summers . Summer drought generates low fuel moistures, and Braunton's milkvetch habitats typically experience stand-replacing fires. The natural fire return interval for Braunton's milkvetch habitats is estimated to range from 20 to greater than 100 years, averaging 70 years . Chaparral ecosystems, with natural fire return intervals of 50 to 80 years, usually experiences high-severity fires . In fall, southern California typically experiences hot, dry "Santa Ana" winds that drive chaparral fires. Such fires can easily burn thousands of hectares, killing most aboveground vegetation . Coastal sage scrub experiences fires of similar severity, but with shorter-frequency intervals of 20 to 25 years . Abundant postfire growth of herbs and sprouting shrub species combined with a dry fire season can result in chaparral and coastal sage scrub reburns in only 1 to 2 postfire years. Short fire-return intervals may convert shrublands to annual grasslands . Annual grassland: Since it is a community dominated by nonnative plants, annual grassland does not have a "natural" fire regime. The presettlement frequency of lightning ignitions in California grasslands is assumed to be similar to present fire ignition rates in annual grasslands, although fire size in California prairie was probably larger. Historically, California grasslands consisted of perennial grasses and forbs but most have been converted to annual nonnative grass species . Nonnative grass dominants may influence the fire regime . California annual grasslands characteristically support fast-moving wildfires. Annual grasses germinate, set seed, and die in a single season, quickly curing into flashy fuels. Grassland fire return intervals range from 4 to 20 years, depending on local climate and ignition sources . Knobcone pine habitats experience a range of fire frequencies from 33 to 55 years. Variations in fire frequency depend on vegetation surrounding knobcone pine stands . Knobcone pine is an obligate fire type with a strict closed-cone habit. This adaptation, along with the general absence of animal agents that might open cones, leaves the species dependent upon stand-replacing crown fire for reproduction. . Knobcone pines have a short life span (<100 years) and rarely escape fire . Tecate cypress forest: During the last century, Tecate cypress average fire return interval was 25 years, with a range of 15 to 63 years [1,39]. However, Keeley  estimated natural fire frequency from 50 to 100 years for Tecate cypress communities based on reproductive rate data [1,10,41]. Tecate cypress is a fire-adapted tree species. It occurs in areas with extensive shrub cover and high probability of large crown fires. Mature trees die while fire releases the seeds within the serotinous cones. Tecate cypress begins producing cones at 10 years and reaches maximum cone production at 50 years. Fire return intervals less than 10 years could destroy populations and fire return intervals less than 50 years could reduce the number of seeds available for repopulation [18,30,42]. Fire regimes: The following table provides fire return intervals for plant communities and ecosystems where Braunton's milkvetch is important. Find fire regime information for the plant communities in which this species may occur by entering the species name in the FEIS home page under "Find Fire Regimes". To date (2006), literature documenting fire's immediate effect on Braunton's milkvetch is lacking. It is mostly likely top-killed by fire. Seeds of Braunton's milkvetch germinate in response to fire. Braunton's milkvetch has a woody caudex that could allow for vegetative regeneration following low-severity fire. Populations have increased dramatically following wildfire events [12,30,36]. 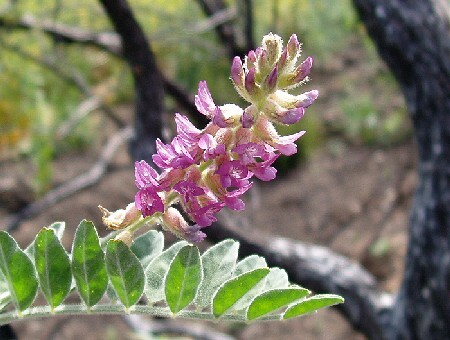 A large population of Braunton's milkvetch (approximately 400 individuals) was documented in 1985 between Gypsum and Coal canyons of the Santa Ana Mountains after the 1982 Gypsum Canyon wildfire [30,36]. A prefire population count was not made, and method of regeneration (from seed or by sprouting) was unknown. Further research is needed on the fire ecology of Braunton's milkvetch. Active management of potential habitat for Braunton's milkvetch should be considered. The use of prescription fire would probably increase population numbers by inducing germination of seeds from the seed bank. Construction of fuel breaks and firelines by heavy equipment should be avoided because it may disturb the soil seed bank as well as encourage the spread of nonnative species . Braunton's milkvetch is a source of nectar for megachilid bees and bumble bees [12,36]. Research is needed on other possible plant-animal relationships. Braunton's milkvetch is often found on disturbed sites and therefore is likely to have a low tolerance for shade and growth interference from other plant species. Removal of shrubs and nonnative species with minimal soil disturbance near known Braunton's milkvetch soil seed bank locations may encourage establishment of new populations . Braunton's milkvetch habitat is threatened by private and urban development. Much of the suitable habitat for Braunton's milkvetch occurs on privately owned land and is at risk for destruction. Braunton's milkvetch has not been found on National Forest System lands, but potential habitat is protected [34,36].